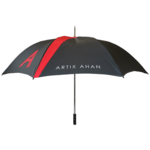 Promotional umbrellas are a super advertising tool for a company. 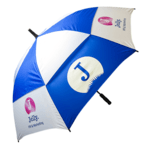 We have supplied thousands of branded promotional umbrellas including standard and bespoke umbrella designs over the years and have developed extensive experience in personalisation for a marketing campaign. 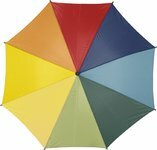 For many umbrellas there is a wide range of options including panel colours, handles and grips. 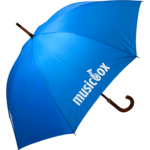 Each of our branded promotional umbrellas is normally supplied in its own cardboard box for easy distribution. 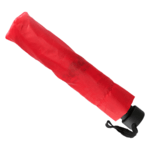 Most promotional umbrellas have up to eight panels. In terms of material colours they can be supplied the same or alternate matching. Each panel can be screen printed with an imprint. It is normal to brand at least one to four panels or more. The imprint can be a single or multiple design. 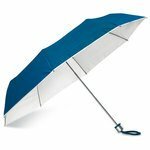 Material colours can also be Pantone matched for some umbrellas. 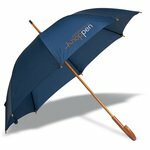 Some promotional umbrellas offer a choice of shafts (metal or wooden), handles (wooden or rubber grip) and end points (metal, wooden or plastic). 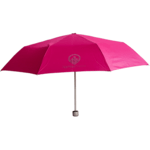 Most umbrellas can be shipped branded within ten working days. Express delivery services are available but with an expedite fee applicable. 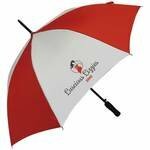 Please let us know if you need more information or assistance choosing an umbrella for your promotion. Our team of experts can be easily contacted on 0800 158 3080. 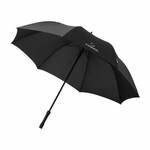 What are the delivery options on Umbrellas? 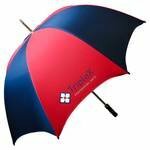 Most umbrellas can be shipped within ten working days however express delivery is available at an extra cost, please enquire for further details. Generally larger volume orders supplied from Europe and the Far East may increase the lead time to around four to six weeks. 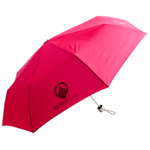 It can depend on the branding, colour and style of umbrella selected. How many panels can you print on? 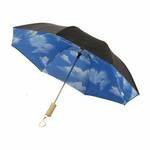 When it comes to umbrellas you can print on as many panels as you want. 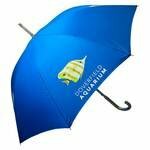 We often supply umbrellas with print applied to just one panel. The highest price is to print on all the panels. An alternative is to print on every other panel. 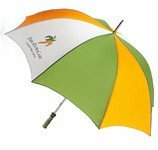 At the end of the day this is a 360 degree product and so even with one panel printed you can be sure that your logo and imprint will be seen. 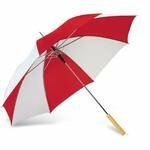 What umbrella options do you offer? 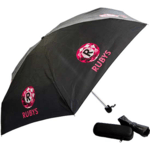 We can customise many of our umbrellas in several ways. Handles and shafts can be supplied made from different materials including metal, wood and plastic being the most common. 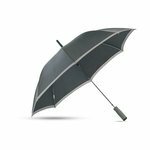 It is also possible to supply stormproof umbrellas in that the umbrellas are more robust and designed for use in strong winds. 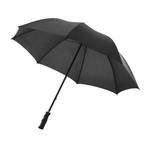 These types can often be found on golf courses and at outside events. 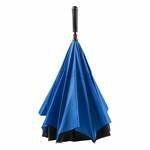 Umbrella panels and materials can also be custom made. 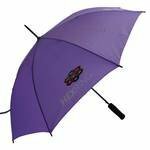 Remember though that for custom umbrellas we are looking at a factory produced and printed item on about 8-10 weeks or more for delivery.